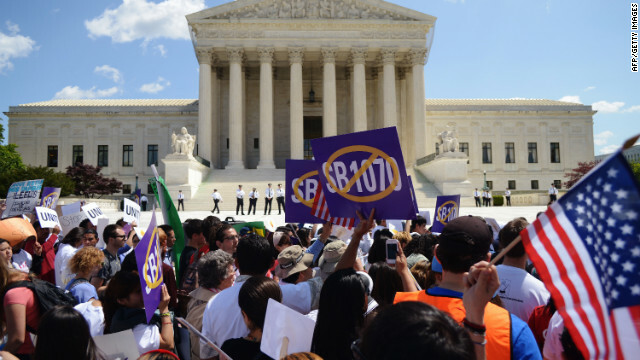 The Supreme Court ruled largely in favor of the U.S. on Arizona's immigration law, but it upheld the most controversial provision involving police checks on people's immigration status. By striking down three of the four major provisions and upholding the idea of federal authority on this issue in pretty sweeping comments, the Supreme Court has signaled other states with similar laws that they better tread carefully or make sure their laws do not to reach too far. In Justice Anthony Kennedy's majority opinion, his main point was that the national government has significant power to regulate immigration issues. And so that lets states know that while they have some place to play in the issue, the federal government still reigns supreme. While the court didn’t tell Arizona and other states what they could and couldn’t do when they conduct a traffic stop – for example how long police can hold someone, whether the law would amount to racial profiling – this opinion is essentially guidance moving forward. Their opinion was certainly not a complete smackdown of Arizona's law. Instead, it left some things pretty ambiguous.